In the second episode of this season of the podcast, there was a free-for-all round table on the direction of art in Magic. While I never like to retread podcast topics in written content, I feel like the people who liked old art got a bit of a short shrift. There was a fair bit of talk about the advantages of the new art for the purposes of flavouring a set, how it creates a brand, and what sort of feelings the new style of art might evoke. But, what about the old art? Some of it is not particularly compelling, yes, but there were good aspects to old art. Old art lent a different feeling to the game, and arguably, it enhanced the experience when compared to new art. A couple of things before the starter pistol: I am not an artist; even my sharpie alters are the worst. I am also not an art critic; I can’t identify what makes art technically good. My capability to identify an artist, or a piece of art’s style is as accurate as throwing darts blindfolded with sticky-notes bearing names and styles on a wall. This article is not about what kind of art looks good, and is more about what art evokes. Especially, this article is about what old Magic art meant to me, and how new Magic art often fails to appeal. Further, this article is not going to be technical in any way; I am going to discuss how it feels to play a card with old art, measured against the feeling of new art. If I were to quickly capture what what I thought of new art, it is that it’s homogenous and unified. There is exactly one style of art, and it is the highly polished photoshopped style. There are a lot of advantages to this new style of art. For one, creatures that are meant to be of the same species look like each other. Vampires from Zendikar all have the same extruding bones, and many have the same penchant for red tattooed lines. Additionally, new art has a unified theme for setting. Looking at Innistrad block art, all of the buildings have the same semi-gothic architecture; they all have broken arches, vaulted ceilings, and are typically depicted as tall (though there are no flying buttresses, and I do not grieve their absence). Added to this, is the manner of dress for humans, and the themes of vampires, ghosts, sailors, and pervasive religious iconography, all of which are meant to provide an idea of a time and place near to history. These themes across all Innistrad art creates a compelling narrative of (perhaps) mid-nineteenth century England, but with a fantasy twist. These images are different than modern Magic art. Why should I like this style ahead of the more modern seventh or eighth edition art (link)? Nostalgia, partly. Cards like these evoke feelings of when I first started playing the game, and playing in an era without the vast internet information engine. The other part is way more complicated, and has to do with the perception of the game. When I first started playing Magic, the term ‘library’ meant more to me than ‘the cards not in my hand, graveyard, in play, or removed from the game’ (the stack did not yet exist as a zone as I recall, and stuff removed from the game was really removed from the game). As a catalogue of spells I meant to use against the people across the table, I thought of them as generalized invocations, and the abstraction in art played into that perception. Mike Kerr’s Jokulhaups (or the original Ice Age art, by Richard Thomas) did not, to me, look like the result of a mighty spell set against my foe (or, in this case, set at the world). Rather, the art was meant to paint a picture of what it might do or be like. Like an illuminated manuscript, the representation was meant to be inexact; a best guess with limited information. Many of Magic’s older images evoke a result in potentia: the image describes an event, instead of exactly relaying a scene. I know that I’m treading on thin ice here. The work The Treachery of Images is meant to teach us that representations are simply that, representations. 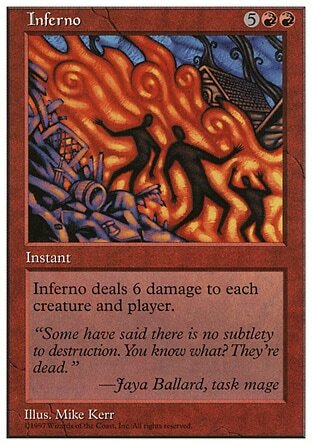 That means that even though Inferno from Fifth Edition looks like more of an abstraction than Inferno from Eighth, they are both simply representations of people being burned. Saying that the Fifth Edition Inferno is one more step removed in abstraction is, perhaps, false. However, the point here is that we might prefer the representation of the Fifth Edition Inferno because it evokes a feeling of inexactitude from the generalized silhouettes of the victims, whereas the Eighth Edition Inferno evokes more exact feeling about the victims because details of their person can be seen. The generality of this is important; art in the modern Magic era often looks like a scene cut from a film. The scene schema removes it from the abstraction of the game itself, and feels, at least to me, out of place. When I first saw Exsanguinate’s art, I was decidedly disappointed. The word “exsanguinate” means to literally “make bloodless” the subject. What’s happening here? One person is stabbing another in the back, and a tiny bit of blood is coming out of the victim. The wound might not even be fatal. Were I to attach a different piece of modern art to Exsanguinate, it might be the art on Victim of Night. Now, that guy, he’s probably lost almost all his blood. But, what’s more, I would prefer something more abstract, like a pool of blood and a less descript victim. 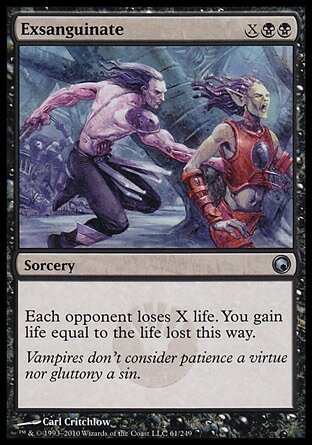 In any case, Exsanguinate’s art is the exact sort in Magic that I hate; not only is it relatively undescriptive of what the card is actually supposed to do, but it fails some level of abstraction. Recall the generality in Mike Kerr’s Jokulhaups. 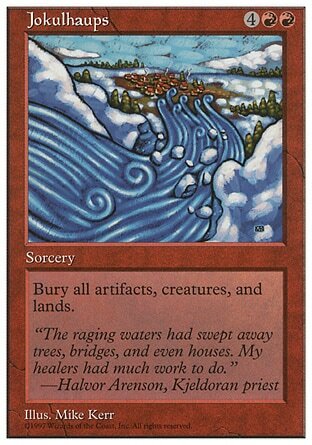 The water in the foreground emphasizes the might of the churning deluge, and the village’s size in the background represents its impending and inevitable fate. Exsanguinate does not play on the mind the same way. Moreover, the soon-to-be flooded village could be any settlement; part of the unrealistic depiction of the flood lends an unrealistic feeling to the specificity of the village. In short, this could be happening to any opponent. In contrast to Exsanguinate, Descent into Madness has fantastic art. The victims on the stairs are suitably non-descript, though it is fairly easy to see they are in distress, and the stairs themselves are evocative of a horrible dark maw expanding to consume them. It does not even have to be as abstract as Mike Kerr’s Jokulhaups or Inferno for it to be pleasing. What’s going on in this painting that appeals to me? The stairs are a mouth and not a mouth. The angle of the point of view is steep, evoking a slippery feeling of doom. The people are vague enough to be anybody. 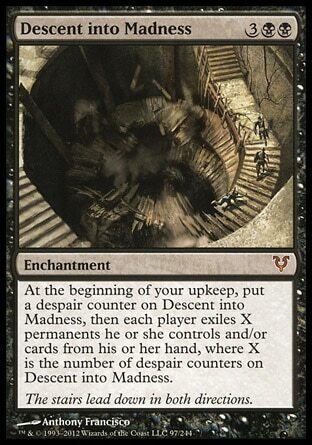 When I look at Descent into Madness, I think “This is how we could all be screwed when I play this card”. When I look at Exsanguinate, I think “This one time, a person stabbed another person.” Even if you take Exsanguinate to be low-hanging fruit, one could just as easily apply the same analysis to Alpha Brawl, Burn at the Stake, or Praetor’s Counsel. The new cards often relay highly realistic scenes, rather than transmitting an abstract idea. So far, I’ve talked a lot about the depictions of victims and how the style of art evokes feelings. I want to stress that the cards for which these features are compelling are typically limited to the non-creature and non-artifact realm. If it’s a critter (unless we’re talking about Roiling Horror, who is supposed to be kind of a mess) or an object, I’m probably going to want to know what kind of creature it is. This is often where the older art fails. What, exactly, is going on with Musician? The idea that I want to represent is one of abstraction for sorceries, instants and enchantments. When I draw a Stasis, it feels like I drew a spell, instead of a scene. Spells that probably would be in books, or on scrolls in my library. By making the art on cards scenes, it gives an inherent weakness to the feeling of the spell: in our imaginations, it shows exactly what will happen when you cast the spell, while an older piece of art, like Pox, requires us to imagine how things are. Forget that Stasis is derided as one of the worst pieces of Magic art, and that it is the only art by Fay Jones in the entire history of Magic. Just for a moment, immerse yourself in the idea that Stasis’ art is an unspecific representation of time stopping. Imagine, then, how it could be represented with modern art guidelines, where everything is a hyper-realistic frame of time. In this particular case, I wonder if the spell’s effect could be even reasonably represented without a high level of abstraction, such as in the original art. I would rather have tarot-like art on cards before realistic detailed scenes. It is the abstraction in art that prompts imagination, and puts magic in Magic.